What is the difference between block and bulk deal? If you are actively involved in the stock market, you might have heard about the terms ‘block deal’ and ‘bulk deal’. Although they both might sound a little similar, yet they are different. There are many people who even follow the block and bulk deals by famous investors, yet do not know the difference. Can you tell, what is the difference between block and bulk deal here? 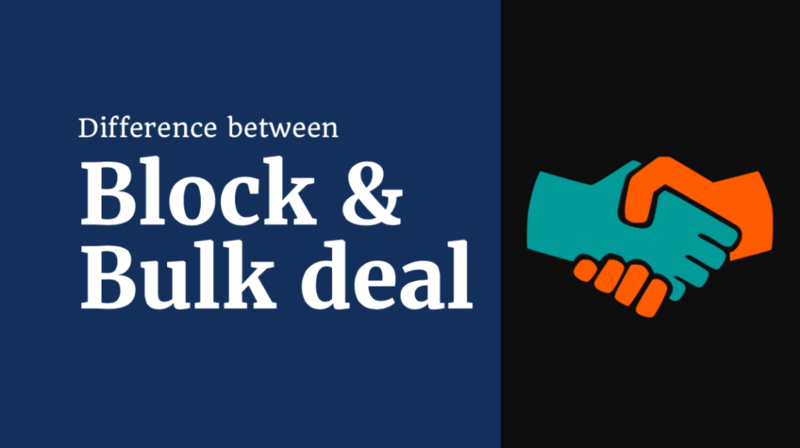 In this post, I will explain the difference between block and bulk deal in simple words. 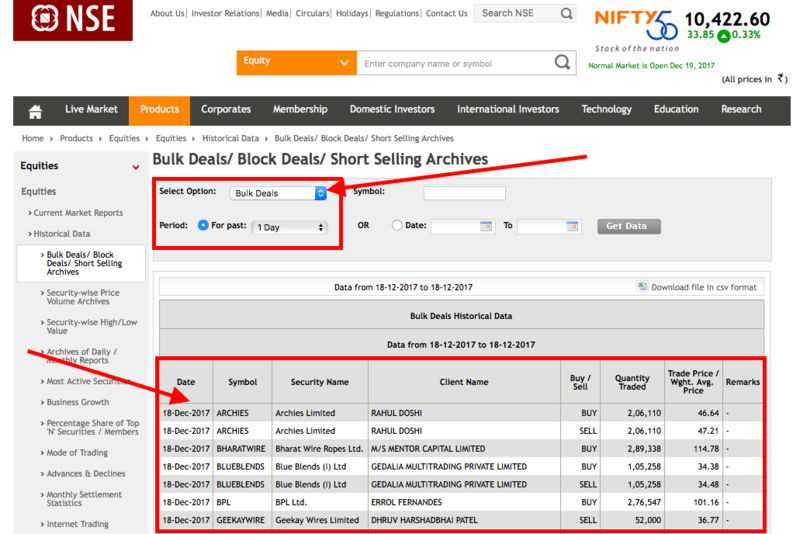 Please read this post until the end because in the last section I will also explain where you can find the block/bulk deal information in NSE/BSE at real time. 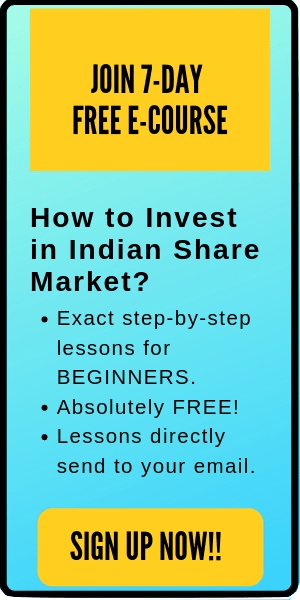 In a block deal, either a minimum number of 5 lakh shares or an investment amount of Rs 5 crores should be executed. Here, the transaction is between two parties when they agree to buy/sell shares at an agreed price among themselves. A block deal should be done at the beginning of the trading hour- from 9:15 AM to 9:50 AM for a period of 35 Minutes. As per the guidelines of SEBI, the price for the block deal should be between +1% and -1% of current price or last days closing price of that share. A bulk deal happens when the total quantity of shares bought or sold is greater than 0.5% of the total number of shares of a listed company. It is carried out through the normal trading window provided by a broker. It is visible to everyone. The broker has to give information to the exchanges about the of the bulk deal within one hour. Who are involved in bulk/block deal? The bulk/block deals are considered to be ‘RICH PEOPLE’ thing. What are the effects of bulk/block deals on the price of the share? There are a number of people who try to clone the portfolio of successful investor through monitoring their block/bulk deal. Although a single block/bulk deal may or may not bring much change in the share price of that company. However, several continuous bulk/bock deals in the company are taken positively by the public and share prices of that company generally rise. 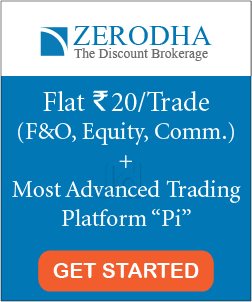 How to find block/bulk deal information on NSE/BSE? Block and bulk deal information can be found on the NSE/BSE website. A simple google search of ‘BSE bulk deal’ or ‘BSE block deal’ will give the full information of all these deals. Nevertheless, here are the quick links to find block & bulk deal on BSE/NSE website. Note: You can get the same information of the money control website. Here is the link. That’s all. I hope you have understood the difference between block and bulk deal by now. Please comment below if you have any questions.